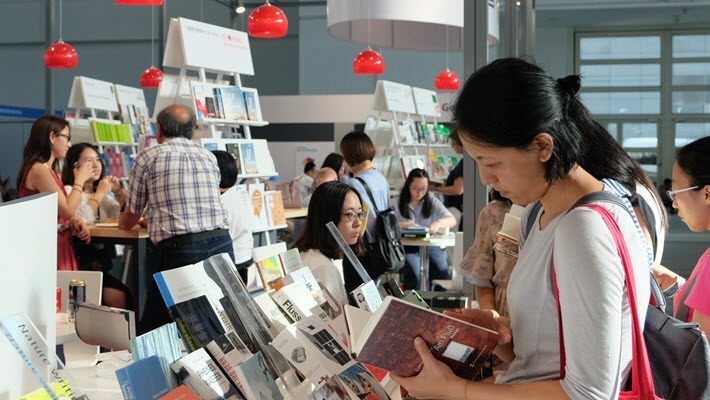 In the run-up to Beijing International Book Fair (BIBF), August 22 through 26, organizers say they’re putting special emphasis this year on digital publishing as well as on its previously announced new children’s area. An expended digital area is to feature Amazon, Baidu, Tencent and Dangdang. An increase in interest in space from digitally oriented companies, say press materials, “reflects the dynamism of online and digital formats. “Online reading”—serial content read by vast numbers of consumers–”continues to be immensely popular in China,” say BIBF organizers, “with the combined income from online reading, digital newspapers, and online periodicals now at an all time high of 6.2 billion yuan (US$907.7 million). 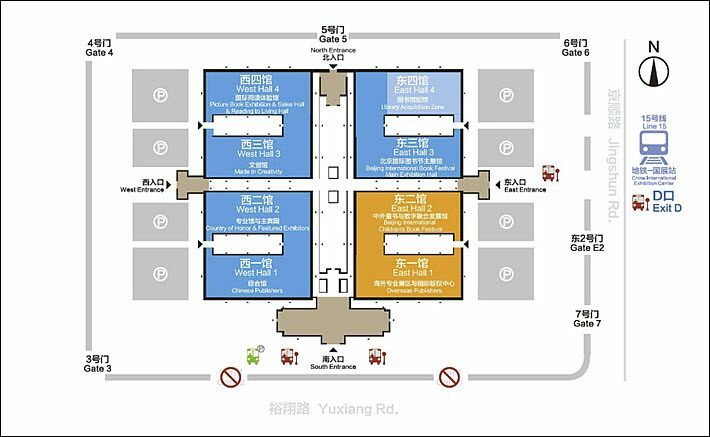 Once more reported to be growing to a larger size than in the past–comprising 97,700 square meters in eight halls–the show is organized by the China National Publications Import and Export Group Corporation. That company reports that it accounts for 60 percent of the market share in publication imports and exports. In its messaging on Thursday (July 26), the show reports that it’s anticipating that more than 25,000 publishers from 93 countries will be exhibiting, with the export-driven UK industry becoming the biggest national exhibition presence. At some 738 square meters, the British book industry, the fair reports, will overtake Korea and Japan—normally the two non-Chinese contingents. The UK turnout is to include Pan Macmillan, HarperCollins, Kogan Page, Nosy Crow, and Phaidon Press. A new combined South American exhibitor buy of space is to include 15 publishers, 13 of them at the fair for the first time. While the Beijing fair is primarily public-facing, its organizers are working to deepen its offer to international publishing exhibitors through the development of professional programming, and that goal is its chief interest in this week’s memorandum to the press. In a prepared promotional statement, BIBF director Liying Lin is quoted, saying, “International publishers now recognize that doing business in China represents huge opportunities, particularly for those involved in e-publishing, and licensing. “Every year BIBF attracts exhibitors and visitors from overseas precisely because it provides a one-stop shop for anyone looking for new avenues. But this year we expect to see a striking increase in visitors representing the whole IP spectrum, reflecting how the publishing and entertainment markets in China are converging. The “Belt and Road” development strategy was announced by Xi Jinping in 2013 primarily for Eurasian countries, sometimes referred to as BRI. The article casts the Belt and Road concept as “shorthand for China’s overseas aid, state-led investment abroad and for Xi’s much-ballyhooed ‘great-power diplomacy with Chinese characteristics,'” and outlines Western concerns about BRI in areas of security, humanitarian challenges, and general Asian influence. BIBF this week is pointing again to its new 14,100-square-meter children’s publishing area, something with which Publishing Perspecctives readers are familiar from our reports in March and May. Stress is being placed on the arrival as separate from the rest of the show with its own branding as the Beijing International Children’s Book Fair, and “covering the whole industrial chain, bringing together IP owners, agents, consumer goods manufacturers” and more. The fair reports that LIMA, the Licensing Industry Merchandisers’ Association, sees China today as the fifth largest licensing market. With sponsorship including Insight Editions and Dorling Kindersley, the children’s area is attracting first-time exhibitors to the show, including Walker Books, Book H, and Imagine That. And having had a good first outing last year, the “Made in Creative” theme is back, with brand merchandise from the creative industries including art museums and institutions, cultural and creative organizations. More from Publishing Perspectives on the Beijing International Book Fair is here.